Mouth guards are acrylic coverings worn over teeth often used to protect teeth and surrounding hard and soft tissues in and around the mouth while playing contact sports such as soccer, boxing, ice hockey, basketball, lacrosse and field hockey. Mouth guards should also be worn by both children and adults while playing these sports as well as non-contact sports like skateboarding, mountain biking, gymnastics etc. There are 2 BASIC TYPES of mouth guards. STOCK MOUTH GUARDS which are preformed and come ready to wear. They can be bought in any sporting goods store. However their fit can’t be adjusted much and makes breathing and talking difficult and provide little or no protection. Dentists do not recommend their use. 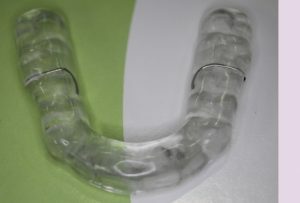 CUSTOM FITTED MOUTH GUARDS are individually designed in a dental office and made after taking an impression of teeth. This perfect fit provides the most comfort and provides the best protection. Generally, mouth guards cover your upper teeth only, but in some instances when you are wearing braces ,you might need a mouth guard for your lower teeth as well. Your dentist can suggest the best mouth guard for you. If you grind your teeth at night, a special mouth guard type of appliance called a nocturnal bite plate may be designed to prevent tooth damage.